A state of wonder knows no boundaries. Ruggieri stages prestigious spectaculars worldwide, in beautiful locations and for major stars. Ruggieri takes inspiration from all modes of artistic expression as a means to create the ultimate experience for spectators. A team of passionate pyrotechnicians cross the world over to light up some of the most prestigious sites. The Major Events creative studio designs firework shows as a theatrical expression: each act is orchestrated to be dynamic, spectacular, intense and enthralling. Plays of light, fire, air and water yield new sounds, redesign space and create new compositions. In 1739 the Ruggieri brothers left their native Italy for France, where they began their brilliant career as pyrotechnicians to Louis XV. Ruggieri continues to perpetuate this festive tradition that has lost none of its appeal over the centuries. 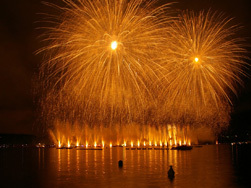 Ruggieri has become the uncontested European leader in firework shows, staging some of the largest spectaculars both nationally and internationally, making concert tours explosive, taking part in firework contests and lighting up the night in cities and towns across France. Spectators are always delighted to see new breathtaking effects. Every year, Ruggieri's laboratory puts every effort into ensuring that their delight is perpetual. Our commitments: ensure simplified and safe display set up; provide variety, originality, rhythm and harmony; ensure optimum comfort and safety of spectators and technicians; leave no footprint on the environment and assess customer satisfaction. 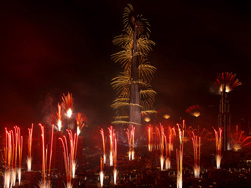 The premier fireworks company in France with a highly structured network of 27 distributors and a subsidiary in China and in the United Arab Emirates. 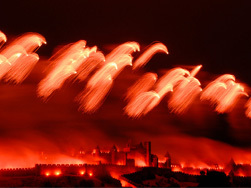 A government certified in-house testing laboratory carries out testing of pyrotechnic products on the market. Ruggieri was the first fireworks company to obtain ISO 9001 and ISO 14001 for its industrial and commercial processes. To ensure safety, fireworks show materials transport is subject to very strict regulations for each transport mode. 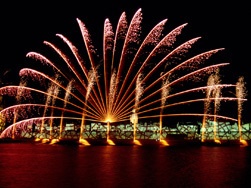 Ruggieri's pyrotechnicians put as much heart as their know-how into firework shows, from the smallest of displays to the most prestigious firework spectaculars. Safety is the guiding principle throughout Ruggieri's organisation. Regardless of the kind of display, the teams ensure optimized and safe installation, in accordance with regulations in effect, for spectator safety as well as that of the 1300 pyrotechnicians operating within its network, and the surrounding property. The Magic of Christmas is Coming to Toulouse: Ruggieri will once again be staging a show in the Capitole square, "Where has Santa Claus Gone ?"